Did you know how sharks give birth? Apparently, it’s not as straightforward as some species! Some sharks are oviparous and some are viviparous. Or some lay eggs and some have live births. 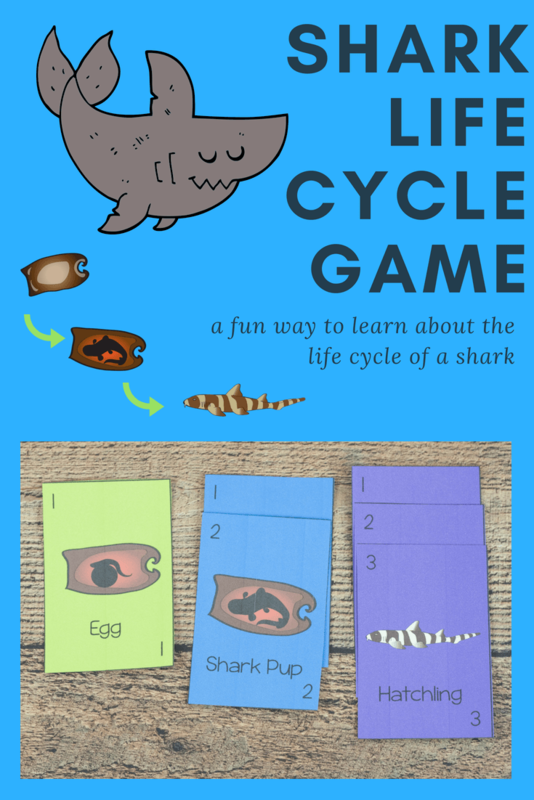 This is a fun game to learn about the viviparous sharks, or the ones that have live births! 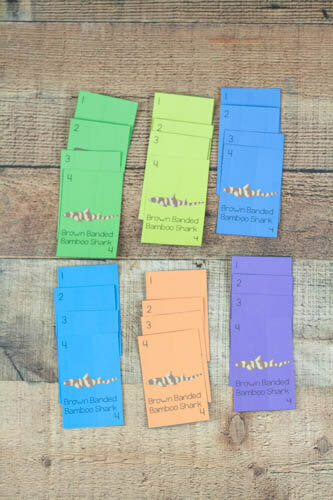 The objective of the game is to grow 6 sharks – one in each color – as a team. There are 4 steps to making a full-grown shark: egg, pup, hatchling, and adult. 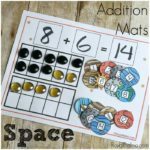 The cards must be placed down in order from 1 to 4 to grow each adult. Every person gets 4 cards in their hand to start with. Then you roll the three dice. The green die tells you how many cards to draw from the draw pile. And the purple die tells you how many cards you must discard. It sounds more confusing than it is (as with so many games) and the rules are included in the PDF file to print. So just give it a try! Let’s say that you start your turn and the following cards have already been played. If you have a 2 (shark pup) in green or yellow, you could play that card. You could also play a blue 3 or a purple 4 and a 1 in any of the remaining colors. You could not play a yellow 4 because you need 2 and 3 first. The final result should look like the following – with numbers 1 through 4 of all colors having been played. I know you’re going to want more shark learning when this is all said and done! And I’ve got you covered. Or the Ultimate Guide to awesome shark week activities. And finally, I’ll leave you with a list of great shark books that will round out your shark learning!